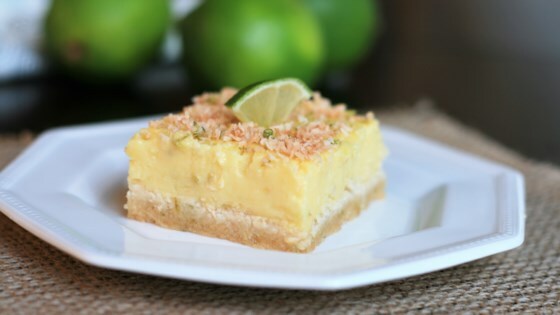 "These keto lime bars are a tangy treat sure to satisfy your sweet tooth! Keep refrigerated. Garnish each piece with a small lime wedge, if desired." You can use granular sweetener in the filling mixture, though I prefer the powdered version since it dissolves better. You can pulse granular sweetener in a blender or food processor to achieve a powdered consistency. For a sweeter bar, add an additional 1/4 cup of sweetener to the filling mixture. For 1 cup of lime juice, you will need approximately 8 limes. I haven't made them yet as we are getting ready to move and I did not have coconut flour and coconut milk and thought I'd wait until we get to the new house to stock up on new ingredients.